Kenzie winning a Group 4th under judge Robert Cole. About Kenzie . 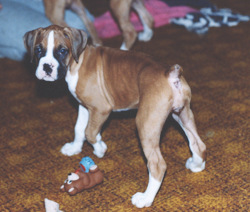 . .
Kenzie was our first show boxer and the start of our breeding program. She was bred three times and produced three Canadian champions, one American champion, and one CD (see Cajan, Nytro, and Cheyenne). Her hips, heart, and thyroid were tested. Kenzie was a true ambassador of the breed and she absolutely adored Dave. That was obvious in the obedience ring, when you saw the two of them working together. Kenzie’s show career . . .
Kenzie started showing at six month's of age but after a few shows, we held her back until she grew up a bit. She was easy to train and would do anything for Dave, in or out of the ring. Dave put Kenzie's Canadian championship on her, and then she was specialed for a short time with Joanne Belter. Together they earned group placements and even earned a few points in the states. 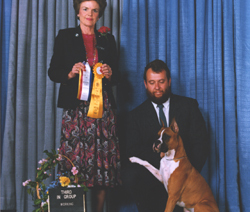 In August 1989, Kenzie won best puppy in group under judge, Quentin Laham. In May 1990, Kenzie obtained her Canadian championship and a Group 3rd under judge, Michelle Billings. In July 1990, Kenzie won a Group 2nd placement under judge, Charles Woodward. 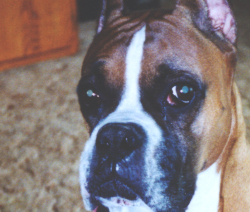 In September 1991, Kenzie obtained her Companion Dog designation with an average score of 194.5. In March 1992, Kenzie won a Group 2nd placement under judge, Robert Cole. In July 1992, Kenzie won a Group 4th placement under Skip Stanbridge. Kenzie at various stages in her life . . .
Kenzie's Group 3rd under judge Michelle Billings.